Through creative design and careful planning, in close liaison with our customer, we can achieve a layout that is both stunning to look at and practical in use. Kitchens can be supplied rigid and adapted to fit for our customer to install; or we can arrange a fully fitted service; with all the close attention to detail expected from a company that values its unrivalled reputation. 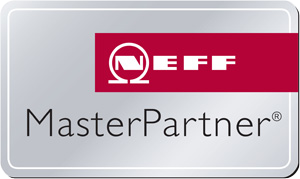 We have specialised in NEFF appliances for the past 40 years and are accredited Master Partners; which means we can supply a full range of NEFF appliances. A wide ranges of other appliances can be sourced too. We are happy for our customers to take all the time they need to make an informed decision. We can offer all the latest gadgets and storage innovation that can make a kitchen or bedroom both beautiful and practical, or we can create a simple but functional space – the choice is yours. Take a look at out Kitchen Elements page to see some of the accessories on offer.